My family and I are flying to New Zealand (AKL) from the USA (LAX) in just over a week. We booked 7 seats (in a single booking), but when I check the American Airlines website it says we don't have seats assigned, and recommends I select seats. The 7 of us are Mum and Dad (my wife and I), 4 kids (16, 14, 13, 5 years old), and our friend. When I go to select seats there is only two areas that have a block of enough open seats for 7 people to at least sit close together, however more than half of these seats cost (approx $86-$120 USD each). Now we don't care where on the plane we sit, we just want to sit together as a family, but can't afford to pay another ~$500 USD to select specific seats. Are we likely to be seated together anyway if we check-in together? Or are we just going to get random open seats? Our flight back is on United and we were able to select seats together on the United website without incurring any extra charge. Here is a screenshot of some of the available seats, to show what we've got to work with currently. Your best bet is to try to phone in and get a sympathetic agent to waive the fees and seat you. But it's entirely discretionary, you have no right to claim these seats, it's just if they're feeling nice or generous. Or try to get some seats when you check in when some of them are released, but there’s no guarantee to this strategy. Once you get on the plane, it's unlikely you'll get people to move. Travel blogs are full of complaints from single travelers who paid the US$100+ to get an aisle seat, who are then asked by families to move to an aisle seat so that they can sit together. There is unanimity that this is not a fair request unless they are being moved to an equivalent aisle seat or bumped up in service class (from an aisle in economy to a middle seat in business or economy plus), or that they are being paid a cash amount that satisfies them (not necessarily the cash amount they paid for the initial aisle seat placement). Indeed, cabin attendants are loathe to force anyone to move unless there is an equivalent or better seat. So the family only has the power of pleading. And people are increasingly not moving, because they paid that $100 for that aisle seat. The reality is that aisle seats are a desirable "product" and the airline is free (absent legislation passed prohibiting it; a moral outcry from its customers; or customers shifting to companies without these policies) to price its product in a way that gets maximal profit. Unbundling services to reduce the base cost is now common amongst carriers and it's what we get by sorting by base price. I really hate paying the $100 for my own singleton travel but I do so (or fly on an airline or in a class that allows for aisle seating). May I ask -- in all bluntness -- why you feel entitled to get a product for free that others have to pay for? If I have wide shoulders or long legs that make sitting in middle-seats uncomfortable, should I get an aisle seat for free? Should couples or business travelers who want to sit together also be able to petition for a waiver of the aisle-seat charge? The one exception I could see would be a waiver for children under 12 to sit next to an adult but that only applies to one of your four children. As you get nearer to the day of the flight - especially once check-in opens - many of those paid seats will be available for free. Of course, that also means that other passengers will likely be able to select them and you may still miss out on seats together. Given that you are travelling with children I would suggest giving the airline a call and requesting that they allocate seats together at no charge. Many airlines will do this to allow families to sit together, although there is no obligation to do so at this time (The US government is considering passing a law to require them to do this for young children, but it has not yet happened). Otherwise your only options are to pay the fee for the seat selection, or wait until check-in or at the airport. I would suggest attempting to check-in as soon as possible after it is allowed (generally 24 hours before the flight) in order to increase your chances of being seated together. You could consider mixed strategies. It is important for the young child and parents to be together. I suggest paying to get a block of three seats including a window for them. If you are willing to risk scattered mid-row seats for the rest of the group, monitor the seat selection in case better choices become available closer to flight time. If not, plan to check them in as early as possible. Let me start by saying that having made a number of intercontinental flights with nine children I can at least speak with a measure of experience. 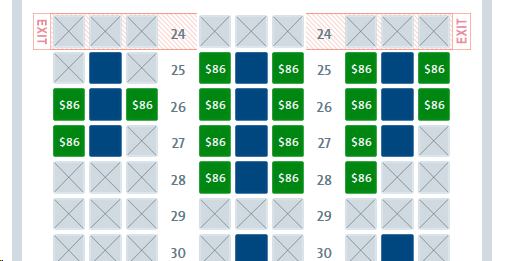 I would not expect to get a block of seven seats without paying extra. As has been pointed out, that's how airlines make money nowadays. I'm heading from Scotland to Australia in a few weeks. Because of time constraints I'm not able to fly on one of my favoured planes or with one of my favoured airlines. I don't lie 777s so for the legs which will be flown in 777s I have paid extra to reserve a suitable aisle seat. On the other hand, for the feeder flight of about 2 hours, it's not worth it. And no, I wouldn't move from a seat for which I've paid a significant extra fee unless the airline were prepared to upgrade me to a different class. I really don't see what the problem is in splitting up your party into groups -- it's never been any problem for us. As long as the youngest of your children is with either a parent or an older sibling it should be just fine. Or at least it's always worked out that way for us. Not the answer you're looking for? Browse other questions tagged air-travel seating american-airlines or ask your own question. Is a 17-inch (wide) / 30-inch (pitch) seat comfortable for a long-haul flight? How can you maximise your chance of an upgrade on a long haul flight?